The thought of just getting on the treadmill and running without a television, mp3 player or other distraction sounds like an exercise in meditation to me, and quite frankly it is. If you find that you have been dying of boredom on the treadmill lately, here are some ideas to keep things interesting. Work Out Your To-Do List: Other runners say that the hour they spend running saves them hours during the rest of the day because they are able to put together a to-do list. Keep a pad of paper and pencil near the treadmill so you can write down the important things that come to your mind while you’re running. It’s just something that you can’t do when you’re running outside. Music: Playing music while I’m running is one of my favorite distractions. The beat of the music is very helpful to keep my running at a good pace. Right now, I run with an iPod Nano, but over the years I have run with skip-free CD players, radios and tape players. Music has kept my feet moving for years. Television: Television has gotten Mike on the treadmill every weekday for months on end. We tape our favorite television shows and only watch them when we are exercising. This particular setup was very easy. The shelf and shelf brackets are premade and bought at a hardware store for less than 20 bucks. The television/DVD player was more expensive because it’s so small. It cost us about $250 when it was new a year and a half ago. For under 300 bucks, you can have a personal viewing studio right in front of your treadmill. Between these few techniques, I am rarely bored when I’m running on my treadmill. When the weather is nice, I love to run outside, but when I’m trapped inside, I have lots to keep me from dying of boredom. I’ve given my ideas on how to keep a workout on the treadmill challenging. What are your ideas? What do you do on the treadmill to keep things challenging? Do you try different things or do you do the same workout every day? If you see a different idea, do you try it or does it get lost in the shuffle of those “I should do that”s? Why? What would it be like to do something completely different for your workout? If you could do something completely different, what would you do? 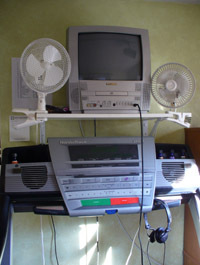 When I got my first treadmill, I had been walking and running outside. 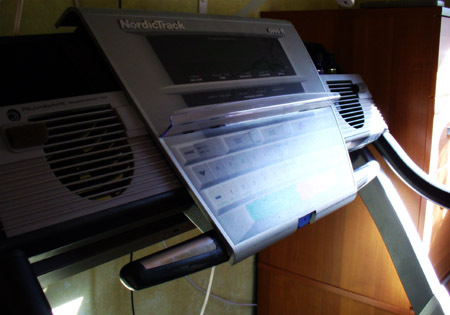 It was a cold and wet winter, so we bought the treadmill to avoid the snowy mornings. I immediately noticed that it was easier for me to run on the treadmill than to run outside. Here’s what I do to keep the treadmill workout challenging. Increase The Incline: Back then, I put the incline on 2% and it felt about the same as running outside. It’s a guide that I usually follow to this day. I usually assume that my treadmill on a 2% incline is about the same as running outside. The beauty of the treadmill, however, is that I can put the incline up to 12% and have an uphill climb the entire time. Try doing THAT outside. Increase The Speed: When I run outside, I slow down when I get tired. It’s not something I do consciously. It just happens and I look down at my Nike+iPod and realize that I’m running slower. On a treadmill, I can ruthlessly set the speed and stick to my interval schedule without mercy. It’s one reason that I like the treadmill better than walking outside because I can stick to my plans much easier. Mix It Up: I can walk backwards on my treadmill, which works my muscles in a whole different way. I can also do side jumps, long lunges and skip on my treadmill. All these techniques work my muscles entirely differently. Sure, I can skip around my neighborhood, but even I am too embarrassed to do that. Wear A Heart Rate Monitor: The most important thing is that you get a cardiovascular workout. If you wear a heart rate monitor and have your heart rate in the proper zone, then it doesn’t matter if you’re outside or on a treadmill. It’s good advice for both sorts of exercise. The truth of the matter is that you’ll get a better workout walking 4.0 mph outside than walking the same speed on a treadmill, but that isn’t what you should focus on. The biggest danger with treadmill workouts is BOREDOM. When you are running or walking outside, there are lots of things to look at and watch out for. When you are on the treadmill, your workout can feel like a never ending walk to nowhere. Stay tuned on Tuesday to find out how to spice up your treadmill workouts. Wendy compares walking on the treadmill to walking outside and noticed that she gets a better workout when she is outside. That may be true, so you have to really mix it up when you are walking on a treadmill to get as good of a workout as you would outside. Stay tuned tomorrow for ideas on how to create a treadmill workout that makes a walk outside seem like just a walk in the park. I once told a friend that I had a personal chef. “Yes, I have many in the restaurants all over town,” was my answer. The only problem with that plan is that restaurant food isn’t always healthy or even freshly prepared. Here are a couple of options. If you wish you had a personal chef, there are companies out there that are willing to create healthy and delicious food for you. They’ll probably even help you with portion control. The Dinner A’Fare | 12 Meals. 2 Hours. Simple. Now, I am on both sides of this argument. The first is: Yeah! There are companies out there who will make healthy food for me to have every evening! The other side is: Geez! You can’t even cook for yourself?! If you paid more attention to what you put in your mouth, maybe you wouldn’t be so fat. That other side is the destructive side of myself. It’s the mean part of myself that berates me until I end up bingeing. If you heard that voice within yourself, sit down with a piece of paper and write it out. What do you need to do to be healthy? If it means paying a company to make you dinner, then it just might be worth it. Via: Rudd Sound Bites: 12 Meals…in 2 Hours! Accidental Hedonist: This weblog is about eating well. Every once and a while they’ll have a health or obesity entry, but mostly it’s about food. Complete Running Network Â» Where Passion Runs Deep: I would like to say that this is a great weblog for people who like running, but it isn’t. They tend to go overboard on their recommendations and idolize people who push themselves to the point of exhaustion. I get a little bit of inspiration here, but it’s hard to wade through all the entries to find it. food museum blog: Another weblog about food and eating well. I get some good information about food safety and such here. Health-Hack.com | Health News and Tips For Computer Users and Abusers: There is some good stuff here. They also have a podcast if you like listening to your health and fitness news. Health Hacks | Healthacker.comThis is a different weblog about health issues. Every once and a while, I find something good here. Usually, it’s just an echo chamber, but if I didn’t hear the original call, the echo helps me. A Passion for Running: I don’t always agree with Mark, but I do enjoy reading his website. He is a barefoot runner who has recently overcome an injury and changed his running style from striking with the heel to landing on the ball of his foot. He hopes to see if this change in stride will improve his running times. I get inspired (or worried) every time I read his entries. Rudd Sound Bites: Whenever I take the time to read Rudd Sound Bites, I usually am rewarded with something entirely different. That’s the beauty of a weblog like this one. It’s pretty unique. Slashfood: This website is all about food in the most decadent sense. If you are going to spend your calories, do it on food that is REALLY good. Don’t waste it on junk. This website gives you an idea of what good food is. SupersizedMeals.com – Foodstuffs of Epic Proportions: Yet ANOTHER weblog about food. The large meals, super-sized creations and strange fair food that make me disgusted and curious at the same time. That’s Fit: This is a weblog that is pumped out by several people posting several times a day. It’s easy to just get buried under the weight of this weblog. Sadly, it would be a great place to turn to if it were comprehensive, but they miss out on some of the coolest things every time. I scan the headlines to see if there is anything interesting. Usually there isn’t and I wasted a couple of minutes loading up fifty entries a day on my blog reader. Treatment Online – Anxiety, Addiction and Depression Treatments: This is where I find out more information on eating disorders like anorexia, bulimia and binge-eating. They also cover a wide variety of other subjects. A Veggie Venture: This weblog is about inventive ways to add vegetables to your life. About.com – Walking for Fitness – by Wendy Bumgardner: If you didn’t know that I LOVE this weblog, you haven’t been paying attention. Some of the best thoughts about fitness come from this weblog. Kudos to Wendy! After looking at my list of weblogs that I read, it’s very indicative of my personality. Dealing with binge-eating disorder is like dealing with an addiction for me. I can tell if I’ve been restricting my diet too much because I end up reading EVERY entry in all the food weblogs. When I feel satiated, I don’t even read those weblogs and just pass them by. When I’m excited about exercise, I read the fitness weblogs more often. When I’m in a binge-induced slump, the entries just keep piling up higher and higher because I don’t want to read about anything. So, if you were willing to read all those weblogs every day, you could almost replace me. Instead, I read and glean and wade through the information and you get the cream of the crop! I have never created a list like this. I tell you about things I find interesting, but I have never made a list of my favorite websites to read for information. Ironically, NONE of the websites Consumer Reports rated would make my list. There’s nothing worse than coming to a slow ballad when you’re in the middle of running fast during your interval training. It can throw you off. If you want to make a workout mix to put on your iPod to make your workouts easier, there is a new product out there that can help you do just that. If you don’t have a Macintosh, you can use this online beat counter. Play your song, and click the key to the beat. It will calculate the BPM for you. It’s a lot more labor intensive than Tangerine, but it gets the job done for free. No matter what you do, you can make your workout a little easier with music. I love upbeat songs with a high BPM because they get my feet moving. Try this and see if you can make your workout a little easier. Question of the Week: Workout Music? There are some songs that make my body want to move even when I’m lying like a lump on the couch. They are songs that I put on my iPod so I’ll have an easy run every time. Do you listen to music while you workout? What songs are your favorite for exercise right now? What songs were your favorite workout songs in the past? What do you use to get you motivated to exercise besides music? 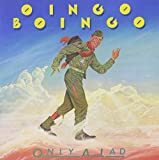 I remember I used to have an Oingo Boingo tape called Only a Lad that I listened to so often that the tape eventually broke. It was the music that I danced to over and over. I must have lost a 100 pounds to that tape (the same 10 pounds 10 times, probably). Even now, hearing Danny Elfman’s voice makes me want to exercise. What does that for you? I’m all for surgeries that are less invasive, but no matter how much I weigh, I wouldn’t be the first one to sign up for this one. Are you willing to sacrifice your vocal chords and the ability to sing well just to lose a few pounds? If you are willing to take the physical risks involved, then be willing to exercise and eat healthy. Don’t let the medical industry sell you ANOTHER weight loss surgery with unproven efficacy. Love yourself enough to take care of your body by eating right and exercising. It’s worth it. Via: Big Fat Blog: Scalpel Free Weight Loss Surgery – Who Benefits?